Easter Chocolate Bouquets and Gifts. 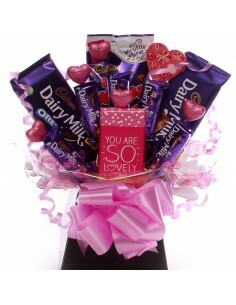 Fathers Day Chocolate Bouquets & Gifts. Baby Soft Toys and Comforters. Night In Hamper For Her. Mug With Sweets For Her. Thinking of You helium balloon. 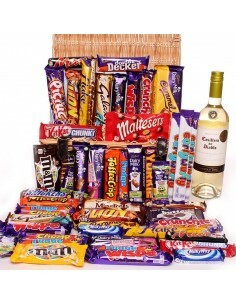 Go on treat them to one of our DVD night in hampers, you can select them a DVD from our drop down which will come packaged in a movie night in gift box, along with a selection of delicious treats to enjoy whilst they watch the movie with a bottle of Prosecco and Stella Artois for them to enjoy. A fantastic couples gift perfect for a Valentine's gift, new home or just to say...go ahead relax and enjoy a night in together. It is illegal to buy alcohol if you are under 18 years of age. We are licensed to sell alcohol to over 18 year olds. 1 Country Candle Company Scented Candle 50hrs burn time. Super Saver Delivery comes up as the default when you add an item to your cart, alternative delivery options are available at the checkout. We aim to despatch all orders placed before 2pm the same day (except Weekends and Bank Holidays). Ordering in advance, please see our pre-ordering instructions below. Delivery costs are based on the weight of gifts. Delivery prices shown are for UK delivery (including Northern Ireland). Super Saver Delivery - £4.65. estimated delivery time 2-5 working days. Not tracked or signed for. Premium Delivery £5.95 estimated delivery time 1-2 working days. Signature required. 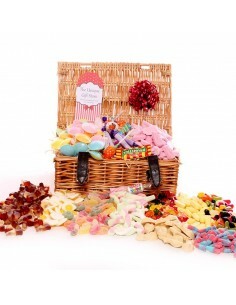 Guaranteed Next Day Delivery £10.95. Tracked/Signature required. (Delivery Mon-Fri) Delivery before 1pm. Guaranteed Chosen Date Delivery £10.95 Tracked/Signature required (Delivery Mon-Fri) Delivery before 1pm. Guaranteed Saturday Delivery £14.03. Tracked and Signature required. Delivery before 1pm. Please follow the instructions below careful to ensure you select the correct delivery option for your requirements. Pre-orders using Guaranteed Chosen Date Delivery and Guaranteed Saturday Delivery- please select your delivery date from the date picker at the checkout. Pre-orders using Super Saver Delivery and Premium Delivery- We can DESPATCH (send out) your order on a future date using Super Saver and Premium but you can not select your delivery date with these delivery options. Please select your DESPATCH date from the date picker at the checkout. If you would like to include a message with your gift, we have complimentary gift tags and will be happy to add this to the gift tag for you. Please leave your message at the checkout in the message box underneath the delivery options. Alternatively we have a range of greetings cards please click here to view our greetings cards, we can add your message to the card if you require this service. We have a large selection of helium balloons available in our send a helium balloon section of the website, to add one of these balloons click here choose the balloon and add it to your cart. Please note that these balloons are not included in the special offer. If you would like to add a Me to You Bear to your bouquet, we will gift wrap the bear and bouquet together for free, to create a stunning gift. Click here to view hundreds of Me to You bears. You Make Me So Happy 7 inch Me to You Bear. You Are So Lovely Chocolate Bouquet. You are so Lovely - Happy Jackson. With Love Me to You Teddy 7 inches. Wine, Women's sock bouquet and Chocolates. 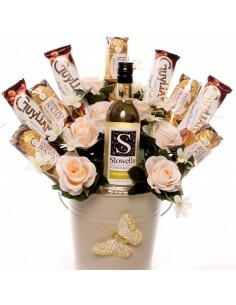 White Wine Ferrero Rocher and Guylian Bouquet. We are an online gift company operating from our purpose designed premises in the heart of Derbyshire UK. Our workshops enables us to design and create unique and unusual gifts that are not available to buy on the high street. 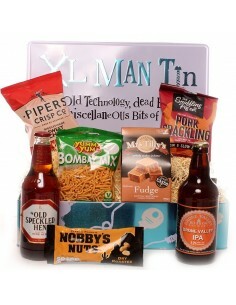 We only ever use top end branded items in our products. Copyright© 2018 The Unique Gift Store. All Rights Reserved.